Twenty-seven Women for Women International Rwanda Program graduates will be among the hospitality team to support the operations of the new Marriott Hotel in Kigali. The hotel hosted a grand opening today, Tuesday, October 4. As a concept cultivated by Bloomberg Philanthropies, a primary funder of WfWI’s programmatic vocational training in Rwanda, Marriott Hotels and Women for Women International kicked-off conversations focused on collaboration in 2015. The primary goal was to select qualified candidates for jobs at the new 254-room luxury hotel. This Marriott Hotel housekeeping team is made up of WfWI graduates. In December 2015, 155 women came to the Women Opportunity Center to learn about the future opportunities presented by the Marriott Hotel team. Women from Kayonza, Rwamagana, Gasabo, Kicukiro and Muhanga districts attended that meeting and were eager to learn more about future opportunities that awaited them. At that meeting, the Marriott recruitment staff promoted various opportunities which included housekeeping, culinary arts, and dishwashing. As the recruitment process evolved over 2016, twenty-eight women who graduated from WfWI’s vocational training program were selected. As a follow-on to WfWI’s core program, WfWI developed a specialized 6-week business English language intensive course to prepare the women for work in the hotel setting. 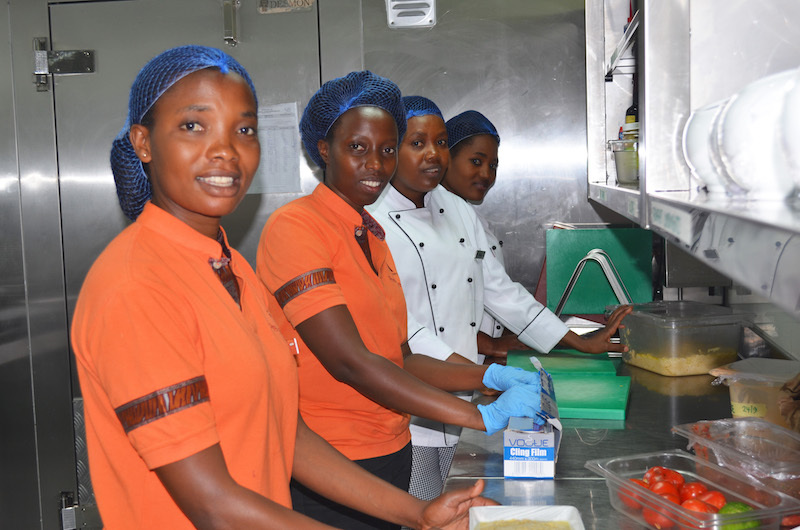 WfWI graduates work in the kitchen at the new Marriott Hotel in Kigali, Rwanda. Highlighted in a Press Release issued by Marriott Hotel, the global hotel chain is proud to be working with community based organizations to help staff the hotel and support it with locally produced goods. “The opening of this Marriott Hotel is providing long anticipated market activity for Rwandan women. It’s a perfect example of how business, philanthropy and government can work together to improve people’s lives,” said Patricia E. Harris, CEO of Bloomberg Philanthropies.